Before Ohioan Alexander W. Livingston developed the Paragon Tomato in 1870, most Americans thought of tomatoes as small fruits with a bitter taste. The Paragon was larger and sweeter, leading Livingston to develop more than 30 other varieties of tomatoes. Livingston's work, along with that of other Ohioans boosted the popularity of the tomato with American gardeners, cooks and diners. Today, Ohio farmers harvest more than 6,000 acres of tomatoes, with the heaviest concentration of tomato farming occurring in the northwestern quarter of the state. Ohio is the nation's fifth-largest producer of tomatoes. The tomato (Lycopersicon esculentus) became Ohio official state fruit in 2009. In 1965, Tomato juice was adopted as Ohio's official beverage. Ohio was the second leading producer, behind California, of tomato juice in the country. 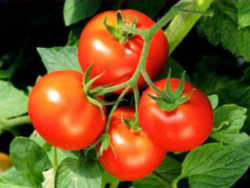 The tomato is the edible, often red fruit/berry of the nightshade Solanum lycopersicum, commonly known as a tomato plant. The species originated in the South American Andes and its use as a food originated in Mexico, and spread throughout the world following the Spanish colonization of the Americas. Its many varieties are now widely grown, sometimes in greenhouses in cooler climates. The tomato is consumed in diverse ways, including raw, as an ingredient in many dishes, sauces, salads, and drinks. While it is botanically a fruit, it is considered a vegetable for culinary purposes (as well as under U.S. customs regulations, see Nix v. Hedden), which has caused some confusion. The fruit is rich in lycopene, which may have beneficial health effects. 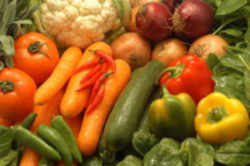 They may be eaten cooked or raw and are a good source of vitamins. The Tomato loves sunshine and is grown as a warm-weather annual, although it is actually a tender perennial. It is grown in greenhouses where summers are too cool for pollination and fruit to set in gardens. The garden varieties of Tomato come from two wild types; L. esculentum and L. pimpinellifolium are originally from western South America. The Tomato was introduced into European gardens in the early part of the sixteenth century, though it wasn't accepted as being edible; this may be possibly because it belongs to the Nightshade family (such as the White Potato, Eggplant, Pepper and other members of the Potato family, Solanaceae) and resembles many plants that were known to be poisonous; it was grown as an interesting ornamental plant. Tomatoes were grown in 1781 by Thomas Jefferson in Virginia, but weren't really known in America as an edible food until after 1834 and it was some years later that they even became popular. Tomatoes grow as a main stalk which ends in a flowery cluster of leaves and fruit. 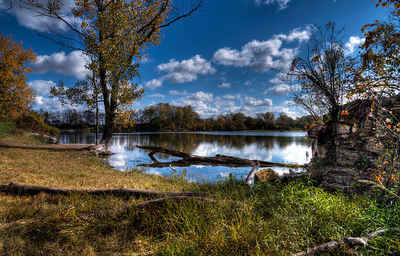 From there, the plant grows a side shoot that ends in another leaf cluster. 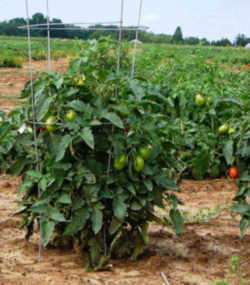 This pattern repeats making the tomato plants appear to be one long main stem, but it is actually one main stem and several side shoots. The shapes of tomatoes are usually standard or what growers call a "globe," which is a round-shaped tomato. A tomato with a slightly flattened-round shape is called "oblate." Other types of shapes used to describe a variety of tomatoes include: beefsteak, cherry, pear, plum and grape. The Roma tomato is an example of a variety that is plum shaped. Beefsteaks refer to large slicing tomatoes. Tomato plants are comprised of only five percent solids. These solids are cell walls, sugars, and acids. The rest of the tomato is comprised of water. 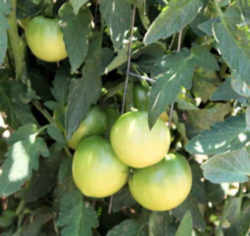 Tomatoes are a green shoot with green leaves and varied color fruits fruits. 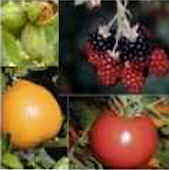 Tomato fruits are usually seen as red, but they can also be green, yellow, orange, pink and white. Heirloom tomatoes are from seeds that are passed down from generations. The fruit is an odd-looking shape and color. Some of these tomato seeds are more than 40 years old. The heirlooms are described as tasty and remain genetically identical by using the same seeds. Hybrids were developed using forced pollination with two different varieties of tomatoes. The development was to create a tomato that was disease-resistant. The shape of hybrid tomatoes, more often sold in local supermarkets, is more perfectly round. The law designating the tomato as the official Ohio state fruit is found in the Ohio Revised Code, General Provisions, Chapter 5, Section 5.081.